The game first asks for the player's first name. You might be anyone, carrying six tasty carrots, standing at a bus stop next to a busy street. A large square is to the east. Your mission is to find six hidden rabbits and give each of them a carrot! 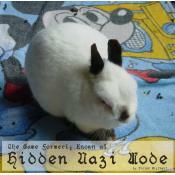 The former title of this game really was Hidden Nazi Mode even though the help menus claim the title is Fluffy Bunny Friends. The game in fact contains a hidden Nazi mode, which can be activated via the command "Join the SS". The Game Formerly Known as Hidden Nazi Mode (Victor Gijsbers; 11-Sep-2010; Z-code). Beta-testers: Dorte Lassen, Matt Weiner, Jenni Polodna, Conrad, and Annette van de Kraats. Download FormerlyHiddenNaziMode.zip from the IF Archive. Contains the story file, an essay about the game, cover art, and source code. The Game Formerly Known as Hidden Nazi Mode - at IFDB. The Game Formerly Known as Hidden Nazi Mode - at ifwizz interactive fiction (in German). This page was last modified on 30 January 2019, at 13:20.